Flt Lt Martin Fulloway receives the cheque from Rotary President Ian Pedrick. Standing by is Rotarian Paul Davy. The Rotary Club of Leominster is pleased to announce another donation to a local good cause, from funds raised through the generosity of the local community. 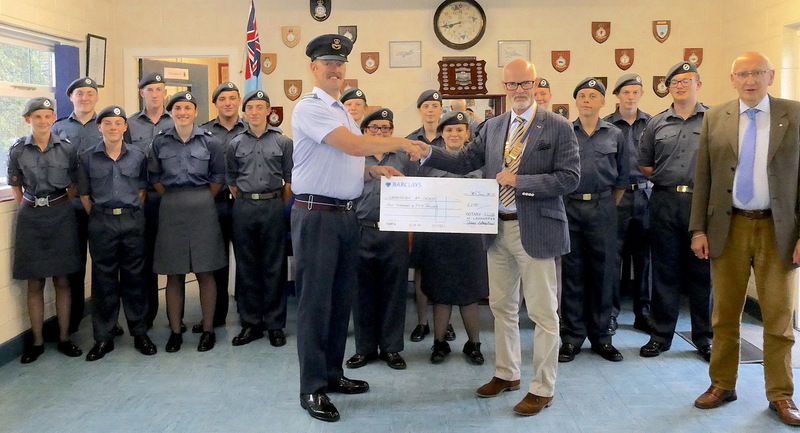 President Ian Pedrick presented a cheque for £250 to the Officer Commanding Leominster 151 Squadron Air Training Corps, Flt Lt Martin Fulloway and these funds will go towards the purchase of drum instruments. The Squadron are hoping to have the drum and percussion band up and running ready for their first public appearance, leading the Squadron at Remembrance Sunday in November. If you wish to find out more about how you can help Rotary and the community, please contact our membership officer, Geoffrey Crofts on 01568 615706 or email rotaryclubofleominster@hotmail.co.uk. The Club meets of the first and third Tuesdays of the month at Leominster Golf Club (6pm for 6.30pm) and potential members are always welcome.